Ok so I am a Windows user, but would it make sense to run a virtual Linux or would that just slow the render time down even more? thanks, seems like a bigger project then, and all just for decreasing rendertimes Hope its worth the effort. That’s not true. You can have linux as a folder on your HD and dual boot it without installing anything and it will be a lot faster than windows. if you could manage to compile blender with mingw, you may have almost the same time as linux, but i couldn’t though! im wondering about different desktop managers under linux, do you think it makes much of a difference between for example xfce and heavier managers? has any work been done on finding out how big a framebuffer cycles needs for this (and larger) file, in order to determine the sweetspot? Thanks for adding my results. It seems that two 460 are a good choice if you want something fast for less money. If you already have a GTX460 and your system is SLI ready, go buy a second GTX460. I got my second one for abou 120€. The speed differs from version to version. I downloaded a new build and got 37.77s. One thing to add to you post, is that GPU rendering such as cycles does not take advantage of a SLI / Crossfire setup, so getting a matching card is only advantageous if you are also gaming. You can mix and match cards without issue, and Cycles can you both. Just keep in mind that you will be limited by the card with the smallest amount of memory when it comes to scene size. Nice to see these results but I think a table showing the best laptops for performance might also be of use. Shame the original table did not have an option to select if we were using workstation/laptop, would have made it easier to sort the data. very nice article and funny to read ! I was wondering what new hardware to buy and that answer perfectly my question … THANKS !! 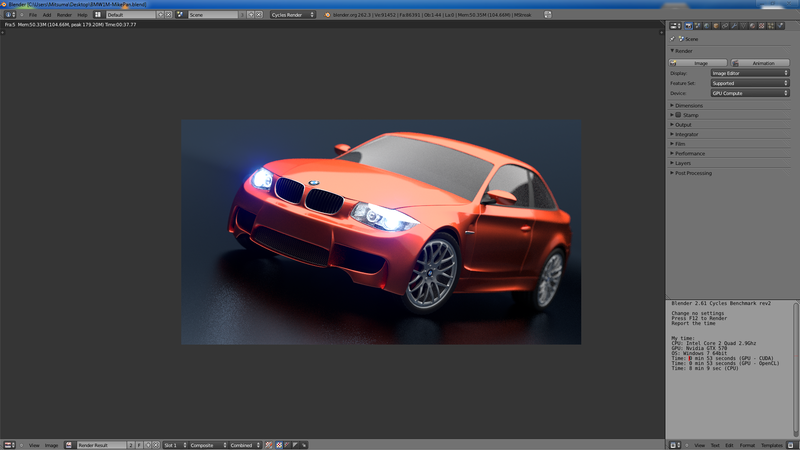 Benchmarking especially with Blender is a mess!! The CPU usage depends on the scene itself. The BMW benchmark f.e. renders on my machine (Dual XEOn Quadcore) in a range of 60-95% CPU load! The cycles island scene o the other hand renders with 99%! So comparing cycles with CPU to cycles with GPU says really NOTHING! Other renderers like V-Ray are scaling better. One more lack in Blender is the not-supporting NVidia Quadros! If you have a geo with more than 6 or 7 polys, the viewport slows down to 0.5 or 1 fps! In the future there will be no more render power for GTX cards, so support Quadros! +1 for laptop data. I am stuck off-site with a company-issued Windows7. “Make” is important too. My work was once much easier using a Toshiba laptop with a CUDA GPU. I am now in slow motion with a Dell, even though it uses a more advanced Intel CPU. Thanks also for the idea to build a box– no company rules against an “assistant” machine, if it stays away from all non-company networks and the Internet. Guess I’d better study what flavor Linux and Windows7 work together in the easiest way. Hello, I love the details on building a system for Blender, what about a system for the person on the move? What kind of Laptop should a person look to buying to handle Blender/Cycles efficiently. i know it wont compare to a full system, but what if it was the only option. What system should/would be best (and before someone says it, I’m not just looking at Alienware systems, they are nice but can you get it the same but cheaper with other brands). …and for recent GPUs? Like GTX 680 etc? There are a lot of things that can affect render times. And these numbers are not accurate. Having people send in render times with very different systems isn’t going to show which video card setup for the money is best. You would have to use the same system with only the GPU configuration changing to get accurate results. The kind of bloatware someone has in the background can significantly change the numbers. The mother board can also change the results. Especially, with dual or triple cards. For instance, how many PCIe slots on their system are true 16x? Video drivers can have a big affect as well. And many other factors. For me, though, it’s simple. Memory is more important than speed. So, I’ll be going for the cards that have 3GB or higher memory. Speed doesn’t matter if I keep getting an out of memory error.